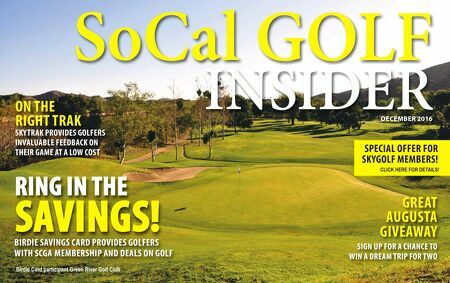 SoCal GOLF INSIDER DECEMBER 2016 RING IN THE SAVINGS! BIRdIE SAvINGS CARd PROvIdES GOLFERS wITH SCGA MEMBERSHIP ANd dEALS ON GOLF GREAT AuGuSTA GIvEAwAY SIGN uP FOR A CHANCE TO wIN A TRIP FOR TwO TO THE 2017 MASTERS ON THE RIGHT TRAK SKY TRAK PROvIdES GOLFERS INvALuABLE FEEdBACK ON THEIR GAME AT A LOw COST Birdie Card participant Green River Golf Club SPECIAL OFFER FOR SKYGOLF MEMBERS! CLICK HERE FOR DETAILS!